I would like to take this opportunity to express my deep hatred for helicopter maple trees. Knowing full well that I would go into deep depression if I lost the three XXL sized trees in my front and back yards, it is still really hard to accept the helicopters each May. It seems they run in cycles. The past two years have been oh so under control. This year? Pure insanity. Look at this mess! Here's the helicopter story, straight from hell. Large bunches of helicopters (seeds) develop in the trees in April. Then? It rains and rains and rains. And rains. Torrential downpour. Over a two week period, the seeds fall to the ground strongly resembling helicopters aka twirly birds. Then it rains and rains and rains. Wet monsoon. The helicopter seeds then magically sprout into cute little maple trees and I want to kill myself. 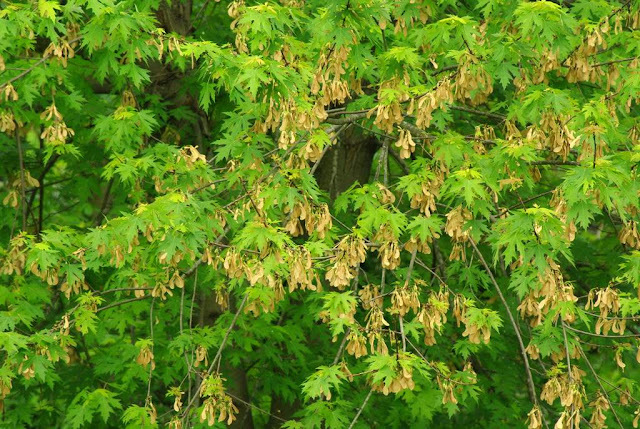 Imagine thousands of tiny maple trees growing in every inch of your entire yard, in all the flower beds, between shrubs, everywhere. In the crease of the driveway pavement. I swear to you. If you think I'm dramatic, you should hear my husband complain. Albeit whilst he cleans out the gutters, pulls weeds while on business calls, and scoops large shovels full of helicopters filling large bag after bag. I just wanted to preface these graduation party day pics with the helicopter story so that you understand the intensity of having a graduation party on the patio during the month of May. My baby graduated from high school! Love the begonias in the flower beds! The cushions and pillows are out! I swear if I hadn't had a graduation party to prepare for, all the cushions and pillows would still be in the basement. No flowers would be planted, and the dead boxwoods would still be in the pots on the patio. Because it has rained. It definitely feels like it has rained every single day, nonstop, for the past 6 months. I will admit my imagination has been associated with exaggeration on occasion. The good news is rain = green. An exceptional and otherworldly kind of green. My very favorite part of spring and summer is green. We wait all winter for things to sprout and then the wrong things sprout. It's constant weeding with big tree's on the property. It looks beautiful - really lovely. I see you have a metal rain barrel. We have one a bit larger and use it as our center table on the lanai. I know exactly how you feel about those helicopters, as I have 8 huge maple trees in my back yard! They are such messy trees, but give the perfect amount of shade in the summer, which we love. They entail multiple clean up chores as leaving it till the end is overwhelming! Ours are just about done dropping now in the Chicago area,so the end is in sight! Your patio and back yard look great. Now you have all summer to enjoy all your hard work! I would take all those helicopters any day for your back yard and patio. Absolutely gorgeous! How do you keep the bunnies from eating all the flowers in your beautiful flower beds? Maresc - funny, the bunnies have not been bothering so far this year.. I see them out and about every once in a while, but not as bad as years past. We finally gave up on our hosta and had what was left removed.. They had a hey day feasting on the hosta! But they don't seem to be too interested in the begonia! yay! !